How Do I Sell My Car at the Dealership? The process for selling your vehicle at Auto Simple is quick and easy. All we need you to do is bring your car to our Cleveland, Dayton, or Chattanooga location along with the vehicle’s title or payoff information, current vehicle registration, a government-issued ID, and all of the vehicle’s keys and remotes. After one of our appraisers evaluates the vehicle we will give you an offer that is valid for the next seven days. If you like the amount we’re offering you can sell us the vehicle on the spot and get paid right then, it’s that easy! When you sell at Auto Simple there is no pressure from our staff and there is no obligation to accept our offer or to purchase your next vehicle from us. That’s why our offers are valid for up to a week after the initial offer to give you time to think things over. Read more: Is No Money Down Really a Good Deal When Buying a Car? Selling your vehicle at Auto Simple helps take the stress out of selling your vehicle. 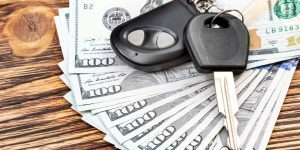 Private selling can make getting rid of your vehicle a lengthy process and often doesn’t get you the amount of money you were hoping for. When you sell your vehicle to one of our Auto Simple locations you will get top dollar for your vehicle each and every time. Be sure to take a look at our online inventory to help you find your next car.